Infoblox is one of the leading producers of DNS, DHCP, TFTP and IP address management appliance (IPAM), and helps you connect users, end devices and networks to one another in the optimal way. The solution puts together local, application-based services, and an extended, de-centralised database technology. This guarantees a constantly operating management, with optimal availability, control and transparency. Infoblox enables automatic testing of network infrastructures, as well as configuration and adaption to specific compliance requirements. The DNS, DHCP, TFTP and IP address management appliance (IPAM) provides relevant control functions on end devices and applications. The DNS management software appliance gives constant overview on your IP address ranges, and can check and automatically manage the distribution of your DNS and DHCP data. Through the solution’s reliable network database and grid technology you can always generate reports of current or older data. Compared with other products, Infoblox offers a stronger security concept, which results in the highest security and smallest attack surface, thanks to comprehensive security functions, a robust operating system and incident-proof appliances. Infoblox Secure DNS manages the DNS Firewall and External DNS Security functions, by which it delivers top protection against DNS attacks, DNS hijacking, and several other attacks. Moreover, the system offers proactive individual protection against DNS-targeted malware. Network solutions by Infoblox let you manage, control and optimise DNS, DHCP and other services; you can use them combined with your current infrastructure or within the cloud, which guarantees optimal availability. DNS Traffic Control lets you route your data traffic to the destination of your choice; central reporting, and the connection to available Microsoft solutions, complete the product package. To achieve scalable and flexible IT service in the cloud, foundation network services must be automated and scaled. The cloud allows for an easy addition, removal or replacement of applications and services. Solutions by Infoblox offer automated foundation network services for virtual machines in data centres; in this way, flexibility is higher and adaptions can be performed in less time, which in turn leads to cost savings. 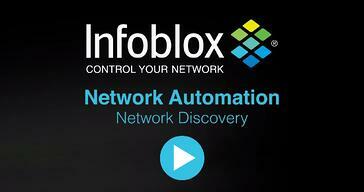 In addition, and with no added cost, Infoblox offers a platform for the automation of networks for discovery, switch port management, changes to network configurations and compliance management. In this way, the risk of network downtime due to incidents is reduced, and so is the workload. Long-term cooperation with Infoblox and a broad customer base. InfoGuard has highly qualified experts in the field of networkidentity-appliances. Find interesting articles about Cyber Security and Cyber Defence in our InfoGuard Blog!